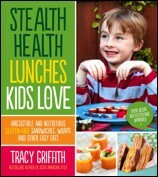 Stealth Health Lunches Kids Love: a new cookbook of kid-friendly, healthy (gluten-free) recipes – Review & Giveaway! Home \ CeliacCorner Posts/Blogs \ CeliacCorner Blogs \ Stealth Health Lunches Kids Love: a new cookbook of kid-friendly, healthy (gluten-free) recipes - Review & Giveaway! 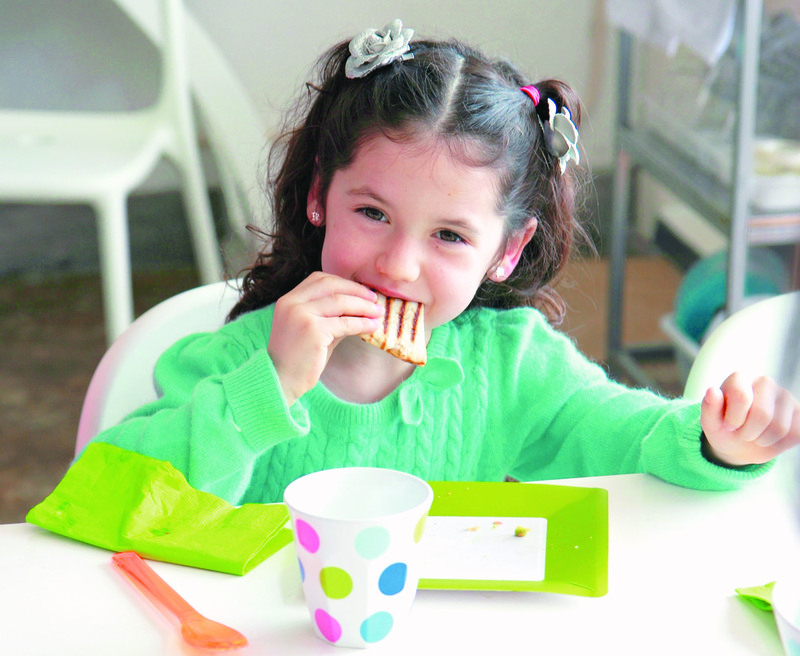 Parents, are your kids tired of the same old, same old sandwiches you are serving them for lunch? Need some fresh recipe ideas? 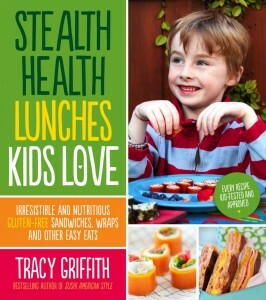 Check out this wonderful new cookbook from bestselling Author and Chef Tracy Griffith called STEALTH HEALTH LUNCHES KIDS WILL LOVE: Irresistible and Nutritious Gluten-Free Sandwiches, Wraps and Other Easy Eats [Page Street Publishing, July 2013, $19.99 US/$21.99 CAN], featuring healthy, all gluten-free recipes (See Giveaway Below!). We all know it can be challenging at times to get our kids to eat healthy, well this book simplifies the task for everyone involved by including recipes that are not only fun and innovative to entice your little ones to the table, but they happen to be nutrient-packed! With recipe titles such as Fruity Patootie Pockets (see recipe below), The Wolverine, AI Caramba! Wrap and Pirate’s Booty Roll, among others, your little ones will be inspired to join you in the kitchen to create them! Have fun together rolling out the nori sushi rolls for “Flower Power Sushi” (includes cucumber and pickled carrots)! 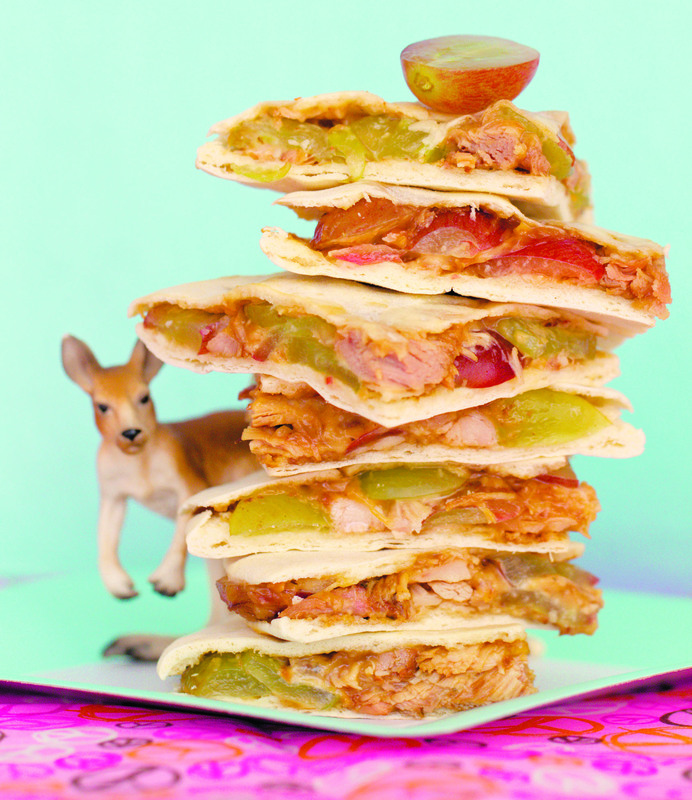 The cookbook is filled with colorful images along with detailed instructions for each “kid tested & approved” recipe. The author also includes chapters on Tips & Tricks, Pantry & Equipment and other helpful information. 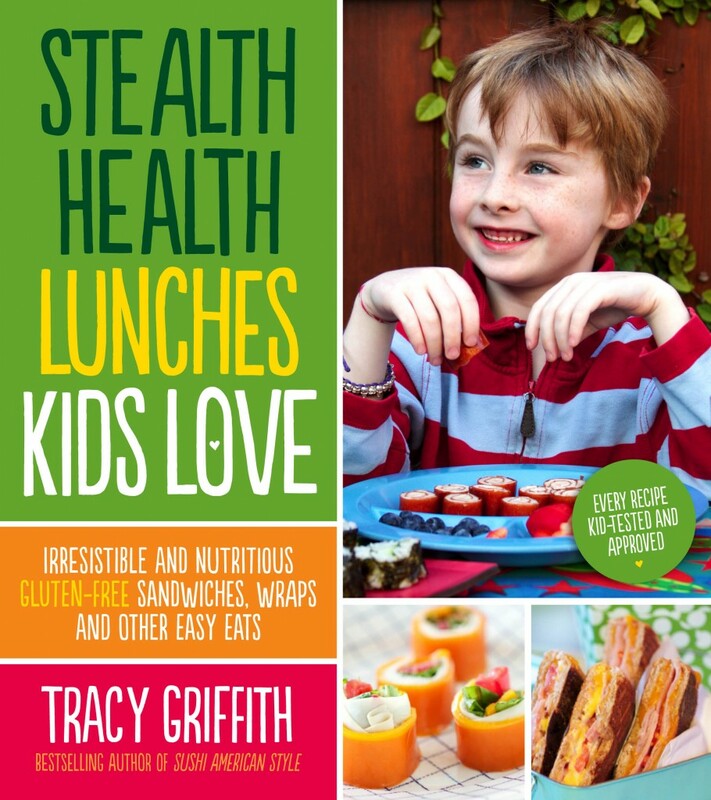 Stealth Health Lunches Kids Will Love cookbook would be a great addition to the cookbook collection of families with a gluten-intolerant child(ren), autistic child(ren) following a gluten-free diet, or any family looking for healthy, fun food to prepare for the entire household. The book will hit the bookstore shelves in July, but you can also pre-order it through our Amazon Store now! In a medium bowl, mix peanut butter, mayonnaise and honey to combine well. Toss mixture with chicken and grapes. Spoon into whole pitas. 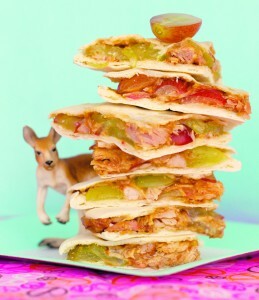 Slip in a few slices of apple on top of the chicken mixture. Serve with Bunny Nibbles or Origami Crisps. Tracy Griffith, who comes from a prominent Hollywood family, is a professional chef and the best-selling author of the cookbook Sushi American Style. She lives and works in Hong Kong, New York City and Napa, California. Ms. Griffith was the first woman to graduate from the California Sushi Academy, and is executive chef for New Gem Foods. Disclosure: I was provided a pre-release copy of this book to download and review. I was not compensated for this review, and the opinions expressed our my own. The Amazon link I provided above is a CeliacCorner Amazon link. CeliacCorner will receive a tiny amount if you purchase through this link .. your price does not increase. NOW CLOSED .. thank you for entering! Lucky Karen is the winner! and ends Saturday, July 6th, 2013 at 8:00 pm (EST). Tell us why (in comments section below) you would love to win this wonderful cookbook (note: be sure to enter CAPTCHA code before hitting submit). LIKE Stealth Health Lunches Kids Will Love on Facebook. Follow CeliacCorner on Twitter, if you are a tweeter & please tweet about Giveaway at least once! That is it! Good Luck. Open to US residents only, entrants must be 18+ years old to enter. 10 Responses to Stealth Health Lunches Kids Love: a new cookbook of kid-friendly, healthy (gluten-free) recipes – Review & Giveaway! I would love to win this to use with my nephews and myself who need to be gluten free! It will help them feel more normal and give their moms some inspiration and support to live gluten free. I would love to win this. The review sounds great. My daughter and I would have fun in the kitchen creating the healthy recipes. My 3 children have celiac, so I am always looking for healthy gluten free recipes. Hello Paula and gluten-free Fabulous Readers! Hello, I have 2 kids with celiac and one with a gluten sensitivity, I would love to win this book to help with lunch ideas. Liked on FB but am not on twitter. Thanks so much. I would love to win this!! I ust liked Celiaccorner on Facebook and will follow on twitter. Thank you for offering this, I hope I will win. My 8 year old daughter has celiac and we love to cook together. This cookbook sounds great. I have two celiac kids at home who love to help me cook in the kitchen. I liked you on Facebook and already are a twitter follower. I’ll be sure to share. Thank you for this great giveaway. I would love to enjoy and learn new healthy lunch recipes please and thank you!!! Karen, you are the lucky winner of this wonderful cookbook! I think you will enjoy it. You will be contacted via email to claim the prize!